Pervasive, consistent messages to young people about drugs and alcohol can prevent substance abuse. Effective prevention requires that the same messages about alcohol, drugs, and tobacco be delivered by multiple messengers--schools, parents, peers, and the community--repeatedly throughout childhood and adolescence. The primary goal of prevention is to delay the first use of alcohol or other drugs. Research indicates that adolescents who begin drinking before age 14 are significantly more likely to experience alcohol dependence at some point in their lives compared to individuals who begin drinking after 21 years of age. In addition, youth who drink alcohol are more likely to experience a number of negative consequences, such as physical or sexual assault, unintentional injuries, memory problems, legal problems, and impaired school performance. That's why delaying the age of first use of alcohol and drugs is a critical goal of prevention. 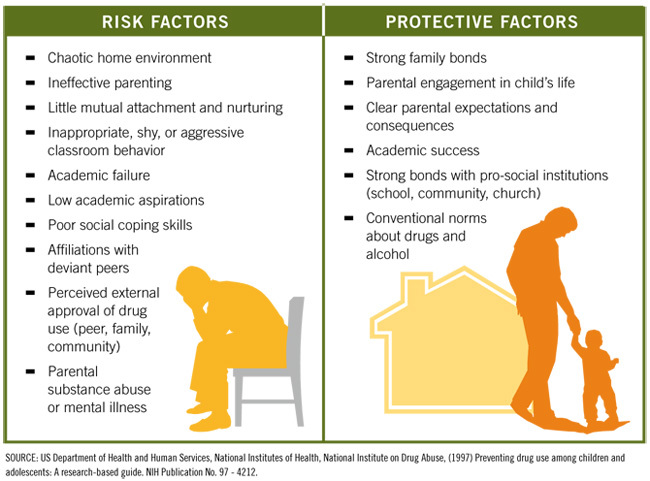 However, other protective factors, especially proactive parenting and strong family bonds, can help delay adolescents' experimentation with drugs and alcohol and thus help reduce long-term problems. Prevention works best when attention is given to multiple risk and protective factors. Such factors exist in many areas of an adolescent's life and common risk factors can predict many problems. Reducing one risk factor may result in reduction of multiple problems in the family, school, peer group, and/or community. Increasing protective factors supports healthy development in all life areas, which helps them to resist influences to use. Who is responsible for prevention efforts? It takes a village. Responsibility for prevention belongs to many individuals and groups, not just school-based prevention programs. Adolescents--Peer mentoring and leadership programs mobilize a powerful prevention force and demonstrate the benefits of prevention and the importance of youth as prevention partners. Schools--Programs that are age-specific, developmentally appropriate, and culturally sensitive should be repeated throughout the grades and re-enforced by youth, parent, and community prevention efforts. One evidence-based program that can be administered within a school setting is Teen Intervene, available through Hazelden. Parents--Parents provide role models, define standards of behavior and achievement, set limits, and provide consequences for risky behaviors. Regarding drug and alcohol abuse, parents must talk early and talk often. Communities--Even subtle pro-alcohol and drug abuse messages should be examined and countered. There should be ordinances restricting youth access to drugs, tobacco and alcohol. And they should be enforced and balanced with opportunities for positive youth involvement. Effective drug and alcohol abuse prevention is everyone's responsibility -- adolescents, schools, parents and communities. Our evidence-based programs, Protecting You/Protecting Me, Project Northland and Class Action are an excellent resource. **The above information is taken from a Butler Center for Research Research Update available for download in PDF. For more information about how to introduce prevention efforts in your school and community, contact Hazelden at 800-328-9000 or email.